We value taste and quality above all. 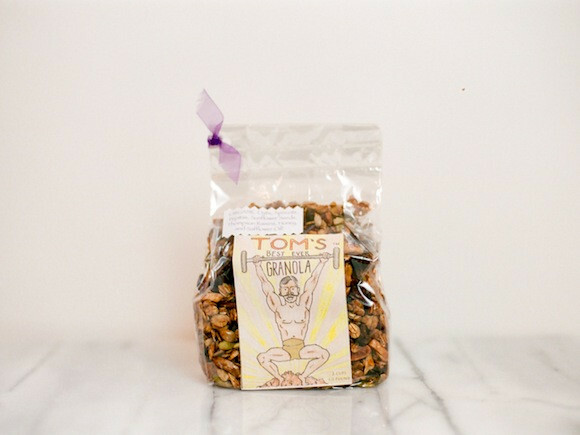 Made locally in the Bay Area, Tom's Best Ever granola is baked in small batches to ensure the highest quality! Our Granola is toasted to a golden brown for better flavor and crunch! In our Best Ever Granola, we value taste above all. We always use unsulfured ingredients, and strive to use organic ingredients whenever possible. Oats, Pecans, Sunflower Seeds, Almonds, Pepitas, Raisins, Cranberries, Apricots, Cherries, Peaches, Honey, molasses, Safflower Oil and Maple Syrup! We also have a Gluten-Free option available -- same delicious recipe, tested four times as Gluten-Free! Keep Tom's Best Ever Granola in the fridge for freshness and crunch!